Rising costs, new laws, old laws, and complexity of coverage: it’s no wonder that health insurance and its potential effect on personal finances is lurking on the edge of people’s consciousness. The good news is there are some options that can help put control back into your hands. Health Savings Accounts (HSAs), in my experience, are one of the most underused financial tools available today, especially when it’s offered to healthy young professionals by their employers. HSAs offer you a way to help keep costs in check, save on taxes, and potentially accumulate more assets. HSAs were made available by law in 2003 and can be used by individuals with a high-deductible health plan (HDHP). In 2017, that means a deductible of at least $1300 for a single individual or $2600 for a family. You may have noticed that these are higher than what you’ll usually see with a traditional plan such as a PPO or HMO. The benefit of this is that you should be responsible for substantially cheaper premium payments. 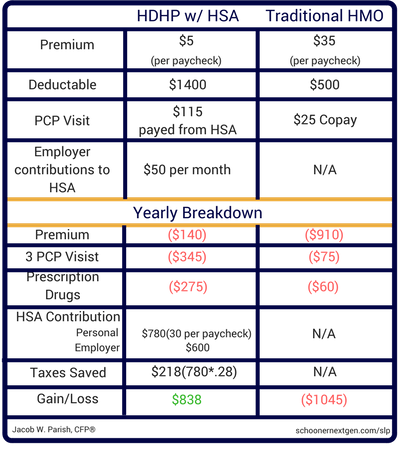 In theory, the premium savings should be contributed to the HSA account. Unlike a flexible spending account which must be used by the end of each year, all contributions to an HAS account are yours and yours alone, forever. Any savings you contribute is on pre-tax basis, lowering your taxable income. There is a yearly cap on what you contribute, for 2017 it is $3400 for an individual and $6750 for a family. While in the HSA, all earnings on contributions are sheltered from tax. This is important because once you’ve accumulated a minimum amount, often $1000, you can actually invest the money, just like you would in a 401k or IRA! Finally, when making withdrawals, if the money is used for qualified medical expenses it is tax-free. Here’s a list of all the qualified expenses. That’s right, if used for those medical expenses, you will never have to pay tax on the money, even if you’ve had large investment gains! Now keep in mind, a High Deductable Plan with an HSA does not have co-pays. You’ll still be responsible for paying a doctor’s bill after your visit from the savings in your HSA account. This will usually be discounted, but will still be more than a standard co-pay. It’s a bit of a bummer, but it comes with a big positive. Those expenses that you pay immediately reduce your deductable for the year. So, in years where you have major medical expenses, it’s actually still possible you’ll spend less with an HSA plan because you’ll reach your deductible quicker. If you need to take out money for a non-medical reason you certainly can; however, you will be required to pay income tax plus a 20% penalty. Once you’ve reached age 65 you can make withdrawals for whatever your heart desires and you’ll only owe regular old income tax. Hold on to this, as it facilitates HSAs playing a role in retirement savings and planning. The dude who chose the traditional HMO plan had $1,045 in total medical expenses for the year. That's actually quite reasonable. However, when compared to the HDHP with an HSA it looks less ideal. That person actually had a positive gain in cash flow of about $838! Now, of course, this is a pretty simplistic breakdown, but it does help illustrate how the right individual could save quite a bit of money using this type of plan. You have medium-sized health expenses coming and no extra cash saved. While years with tons of medical expenses will often be cheaper with an HSA, there is a middle amount of expenses where often a traditional plan would result in less total expense. Usually, that amount is roughly similar to the deductable. It’s a camouflaged retirement savings tool! Let’s go through the checklist. Can you accumulate money in the account? Yes. You can save up to $3400/yr as an individual and the money remains in your control forever. Will my employer contribute for me? Very possibly. I’ve seen employers offer anywhere from $700-1200 per year in HSA contributions. Can you allocate those savings for long-term purposes? Yes. After crossing a certain threshold you can invest your balance very similarly to how you would a 401k or IRA. Are there tax incentives to save to an HSA? Yes. In fact, you have the possibility for the completely unheard of triple-tax benefit. Income tax deduction for the amount you contribute, all interest and investment are sheltered from taxes, and completely tax-free withdrawals for qualified expenses. Psst,…it can be used for extra retirement savings. Now, of course, for us professionals in our mid-twenties and thirties, it’s a play for the future. 65 isn’t exactly right around the corner, but those able to build a healthy account balance during their working years will have a damn powerful tool at their disposal come retirement. It provides flexible planning options for not only income, but taxes and health insurance too.